The B-Cells’ ability to transform into BioWarrior mode is only the first step in their preparation to wage war against invaders. They actually have another trait that makes their BioWarrior mode seem almost quaint — they can create up to seven clones of themselves. It’s sort of the immune system equivalent of having LeBron James play shooting guard, point guard, power forward, small forward, and center. It radically increases the odds of triumph. And once the battle is over, those clones simply disintegrate, their genetic material recycled by the body for future use. Biggest panel on the page: The transformation takes on an even more amazing facet as Blastor and co. begin to clone themselves: their bodies tense as the armor plates over their backs open, and duplicates pull themselves apart from the exposed cytoplasm. CAPTION: To increase their numbers, they are able to create genetic duplicates of themselves. CAPTION: Their exoskeletons shift and unfold, allowing clones to emerge from exposed cytoplasm, each fully armed and prepared to wage war. Moments later, Humron stands surrounded by clones of himself. They resemble him, we can tell they're his clones, but they're not an exact match — their colors are more muted versions of Humron's, they're just a wee bit smaller (I'm talking like 5%). They are B-Cell clones, and we can tell they're clones, not as powerful, nor permanent, their temporary existence is to aid in battle. CAPTION: The B-Cell clones' offensive capabilities are similar to, though less powerful than those of their creators'. CAPTION: And while life itself is a battle for the BioWarriors, the clones' lifespans will last only as long as this battle. 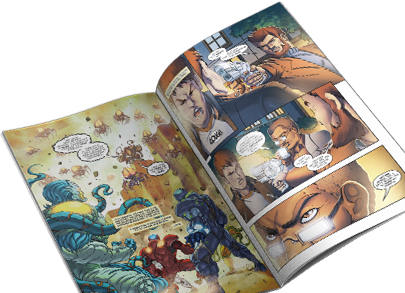 The minute our artists shared this with us, I thought “that is it!” Our artists’ take sidestepped the problem of how to show clones emerging from the B-Cells, and did it in an action-oriented, distinctively comic book fashion. As our art team progresses through the storyboarding stage, interpreting the action in ways that sometimes like in this instance I adjust the script accordingly, so it aligns with their vision. I’m very eager for readers to see and read the final result.